8 Seater Well Furnished HD Video Conference Room is a revolutionary infrastructure with well decorated and appealing interior for entrepreneurs available on Hourly, Half-Daily & Daily Basis on a prime location at Akota in Vadodara, GUJARAT. The HDVC System incorporates Panasonic’s high-quality image and sound technologies cultivated in the development of various AV products over the years. The system conveys facial expressions and nuances of voices to facilitate discussions and remote lectures. This distinctively modish Video Conference Room comes with inclusive amenities like Adjustable Lighting, CCTV, Housekeeping Services, Multiple Power points, 2 Wheeler Parking & 4 Wheeler Parking, Stationary, UPS Back-Up, Tea/Coffee, Wifi etc, and you can get extra amenities like Audio Video Equipment, Catering Services, Courier Services, and Projector etc. Video Conferencing Equipment On Hire and on Rent is provided by our company Majestic Audio Visuals. We are pleased to introduce ourselves as the most preferred provider of Video Conferencing Equipment On Hire and on Rent. 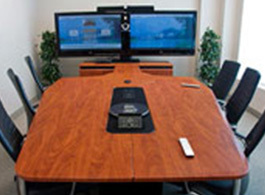 As a leader in this field – our Video Conferencing Equipments are affordable and best quality. We are also a one of the leading exporters of Video Conferencing Equipment On Hire and on Rent in India. Majestic Audio Visuals has been experienced provider of Video Conferencing Equipment On Hire and on Rent since 1970. We provide all kind of Video Conferencing Equipment On Hire and on Rent with best quality and as per client requirement. We are also very wellknown leader to provide Video Conference on Hire, Video Conference Solutions, Video Conference Call, Video Conference Setup, Internet Video Conference, Online Video Conference services.